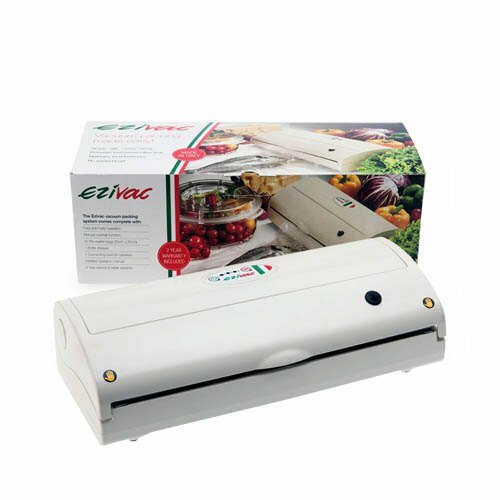 The Ezivac will revolutionise the way your customers buy & store their food! By using this high-quality, Italian-made Vacuum Packing System the life of their food can be greatly extended, saving them time & money! The Ezivac removes over 70% of the air which in turn reduces oxidisation. This eliminates spoilage from freezer burn & prevents microbes like bacteria & mould from ruining the food. It’s not only perfect for fresh foods, but is also fantastic for increasing the life of the dehydrated delicacies your customers have created with their Ezidri dehydrator! The Ezivac system features a range of accessories which includes bags & rollsof varying sizes. These allow the packing of food in any size you wish, taking up less space in the pantry, fridge or freezer. The unique patented ‘track’ design of the Ezivac bags enables the complete extraction of air from the bag in the shortest time, creating a long-lasting vacuum. Canisters are perfect for marinating meat in minutes or vacuum packing meals, liquids or crushable foods. Another great accessory is the bottle sealer which allows your customers to enjoy their unﬁnished bottles of wine for a longer period of time. Bottles can be opened & resealed as many times as they like! The best part about the Ezivac is it’s so easy to use! What sets the Ezivac apart from the rest is its fully-automatic operation – you simply lock the lid down & then it will vacuum & seal in a matter of seconds.